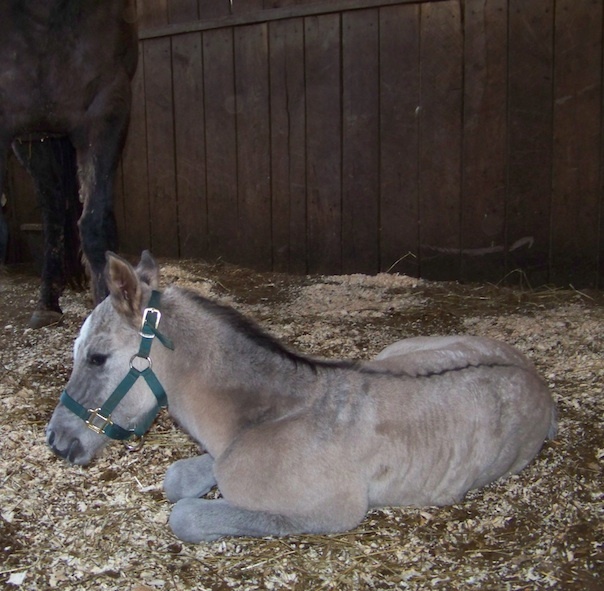 ..Welcome to the 2013 foaling barn! 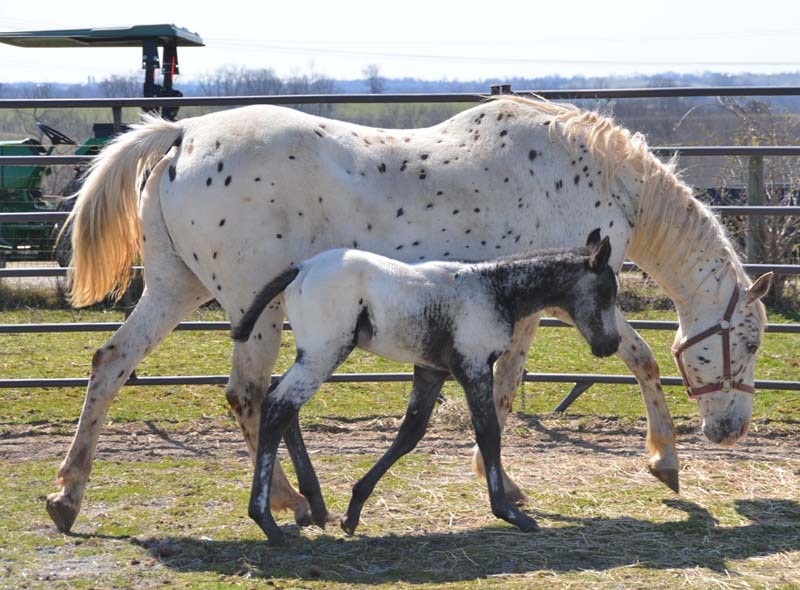 The Appaloosa mares have presented us with our 2013 Appaloosa foal crop. 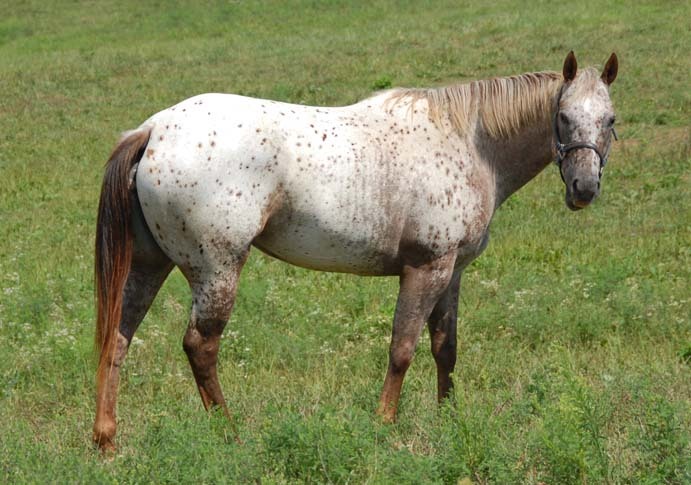 There are 10 colorful mares due to foal over 4 month's time. They were in foal to three different stallions. I enjoy having the foals' births spread out so that I can give each one the proper time and attention to teach them to be gentle and well mannered for their new owners. 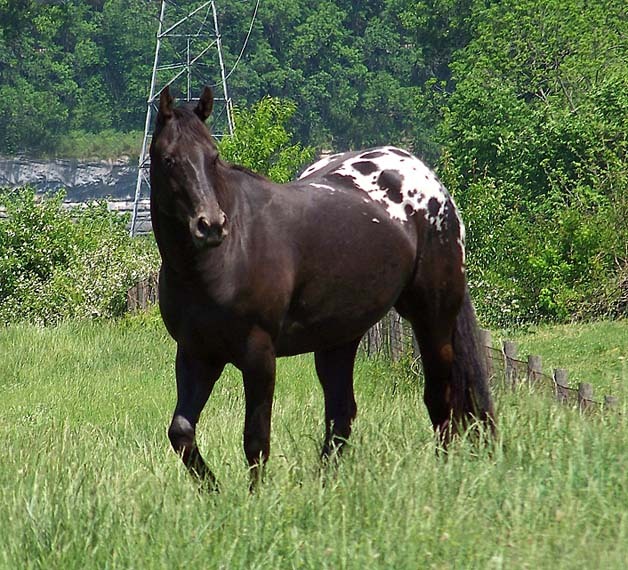 I posted each mare as her time grew near and detailed her development and delivery. 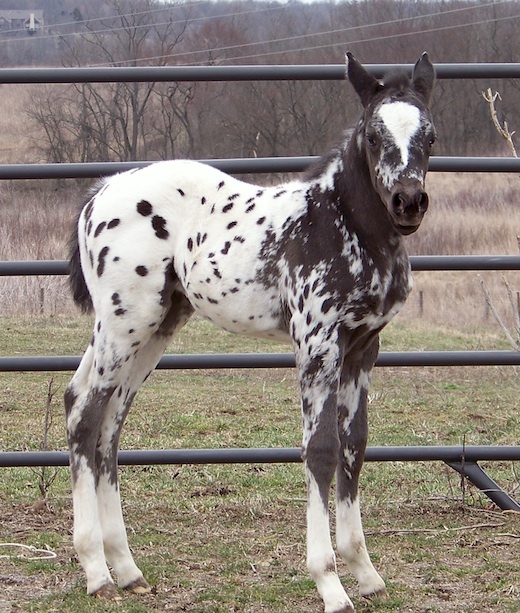 The foals are posted within a day or two of their birth. They can be reserved for weaning time with a 25% deposit. 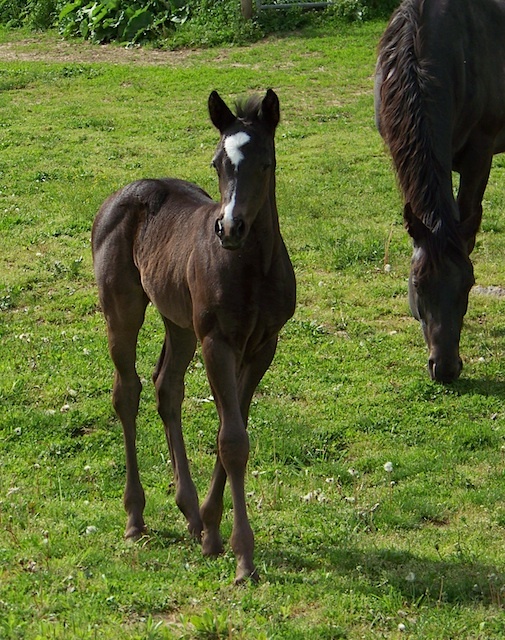 Click here to see our Policy on foal sales. 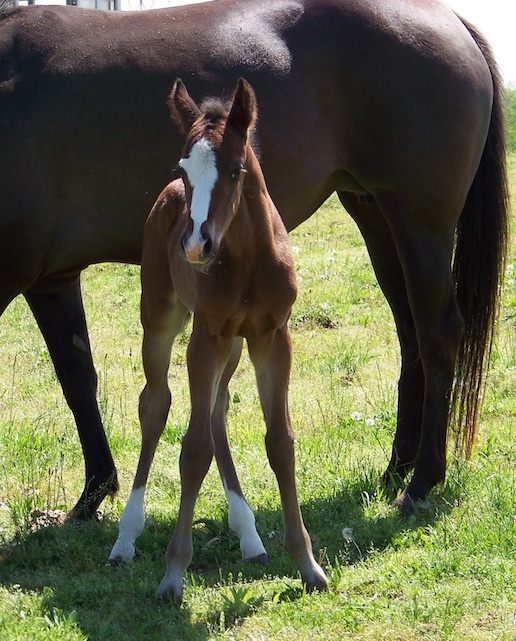 I hope you enjoy the foaling season as much as i do. I love sharing it with my visitors, especially those not lucky enough to have horses of their own. 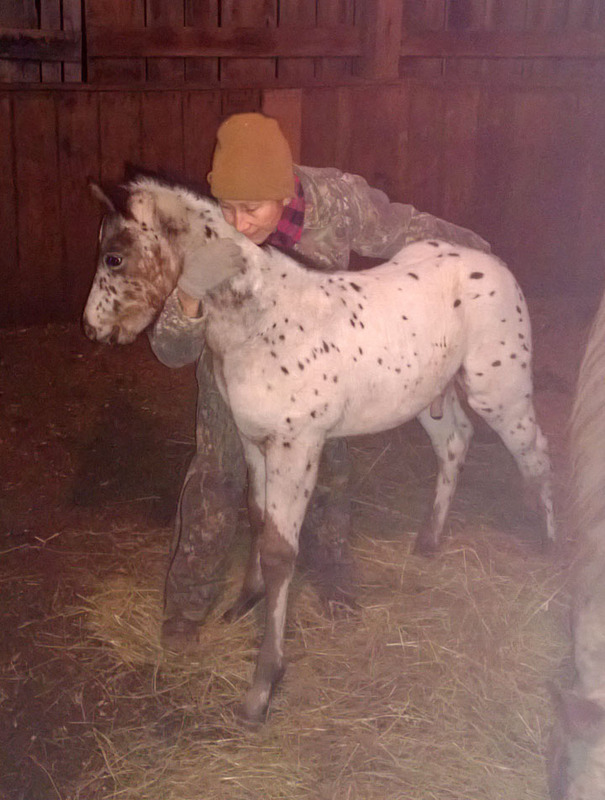 FEBRUARY 8th, 5 am..a LEOPARD COLT! I checked on Jazzy at about 1 AM Thursday, and she was standing quiet and comfortable in the dark. Her udder was full, and had not diminished during her turnout for the day.. which is a sign that foaling is near. She had nothing dramatic going on. No wax or dripping milk and no obvious contractions. So I decided to sleep at the house instead of in the barn. I woke at 6 thinking I had better get back to the barn. 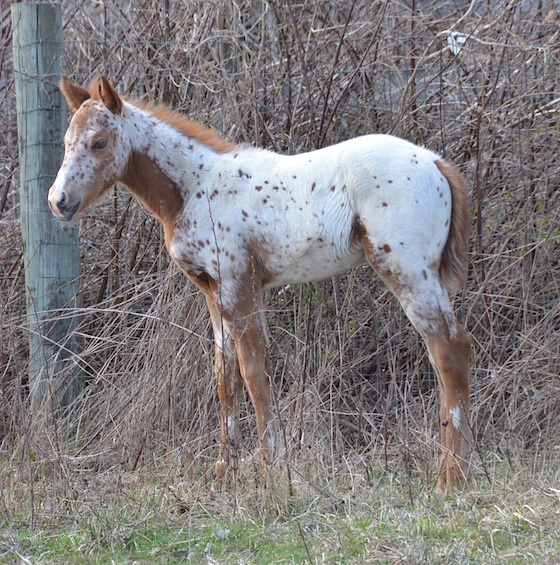 When i arrived, there was her colt standing next to her ! RENO has gone home to Maine! Video at two weeks old! Emma is at home with Cindy in KY! Mauzi was a maiden of 4 years old. She showed the first sign of udder development on February 6th which put her right on schedule for an early March baby. Skips Jazzy Blue began to catch up to her in her readiness to have her foal, and I began a double foal watch last wednesday night. "Is there a movie you would like to see tonight, Lisa?" said Mitch last night. My answer? NO! I have two mares about to deliver and I dare not leave them for more than an hour! So at l0 pm I camped out in the tack room hoping for a fruitful night of foaling. Abby has gone home with Carolyn! We left Mauzi and Tango tucked in their 24 foot foaling stalls at about 8 pm last night. The weather was still grey and drippy with wet snow flurries and the temperature was dipping into the 20's. Both Mauzi and Tango's udders had shrunken some during their cold turnout, and there was no sign of wax or milk on either. I mentioned to Mitch that Tango had "USUALLY" foaled 4 or 5 days after her due date , and added that "USUALLY" means pretty much nothing to mares, who foal when they want to. We laughed at ourselves, foolish humans who think they are in control of the situation! Nova has gone home to Colorado! 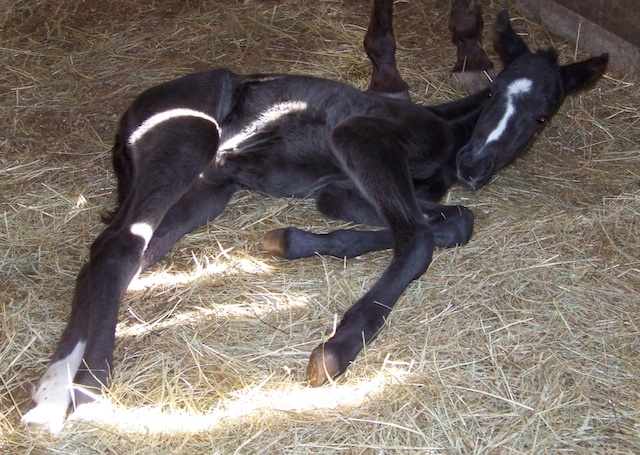 I finally lay back down to rest at about 5 am after Mauzi's foaling ,and found it hard to fall back to sleep. Jazzy had observed the whole spectacle from directly across the barn aisle. She was fine, showing no sign of labor. She called out frequently asking if she could have some of that hay I was giving to Mauzi. She had a hearty appetite and no wax or milk. So I took a nap. It was 7:30 when i got up and glanced in her stall to find her grulla filly standing nicely, but still damp and not having nursed yet. I'd say she was oh.. a half hour old!!! So I spread out the straw, helped her nurse and disinfected the umbilical stump. I love experienced mares. They don't need me! At midnight I forced myself out of a warm bed to return to the barn to check on Mauzi. She's been advancing toward and backing off of foaling for two weeks. I watched her for awhile on the camera from the tack room and her behavior was only slightly restless. I normally have two cameras on two foaling stalls on a split screen, but last summer's foster dog, Cami, ATE THE WIRES!. I just ordered a second wire for Tango's camera, but it has not arrived just yet. I figured i had plenty of time. 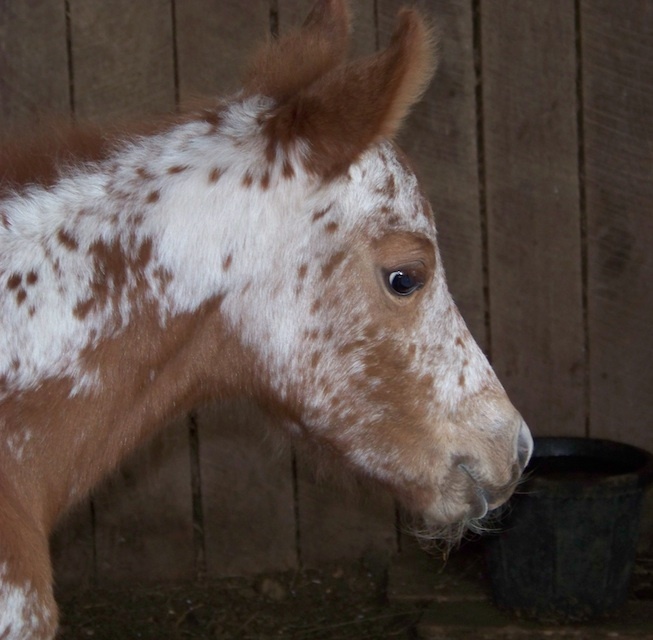 After all, Tango USUALLY foals 5 days late. on her side pushing, white amniotic sack showing, and water breaking. WHAT LUCK! I went for a bale of straw to spread all around the mare and foal, and I heard some gasping for breath as I came back. I stepped in and pulled the membranes from the foal's face and stepped out quickly not to ruin the moment or cause Tango to rise prematurely. After letting them rest a bit, I quietly returned and cleaned manure and spread straw all around the couple to cushion the foal's falls while she attempted to rise, and make a barrier from the germy floor. I doused the baby's umbilical stump with disinfectant and set about drying her with a towel since it was about 24 degrees. I also milked Tango as she lay there and syringed colostrum into the filly's mouth to begin the process of building immunity. 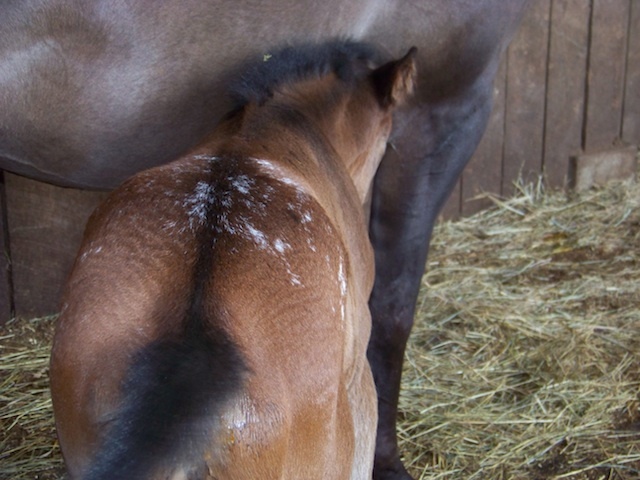 The taste of the milk immediately started the filly searching for the udder and trying to stand. Once the filly lurched and staggered to her feet and was looking for milk, I lay down for a nap in a pile of barn cats trying to share what warmth I had. 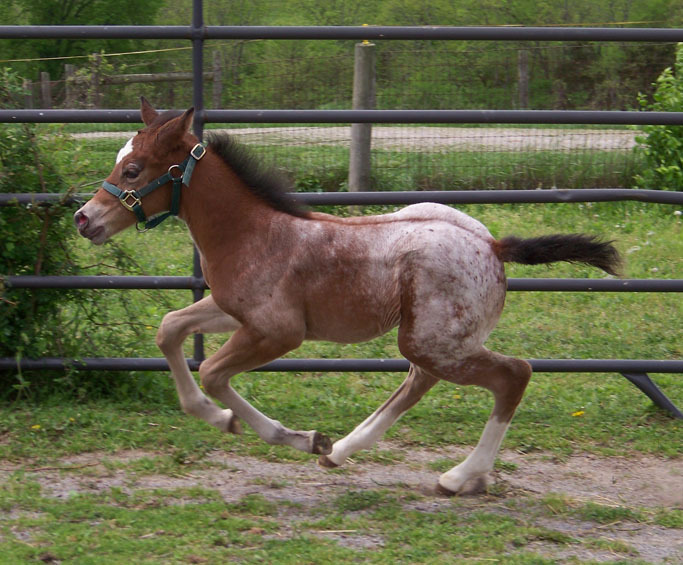 I set a mental alarm and got up in an hour to check on the foal's progress. She was nursing well. I returned to my spot under a sleeping bag adorned with cats till Mitch arrived with coffee at dawn. xtAt 2 am I began to notice Mauzi's activity level picking up and her tail cocked to the side. I got up and secretly began to observe from the stall side. 2:20 became 3:20 because the time changed and she was now getting up and down with amniotic fluid leaking and one foal foot showing. This continued for many contractions and pushes, and I decided the progress was slow and the clock was ticking. 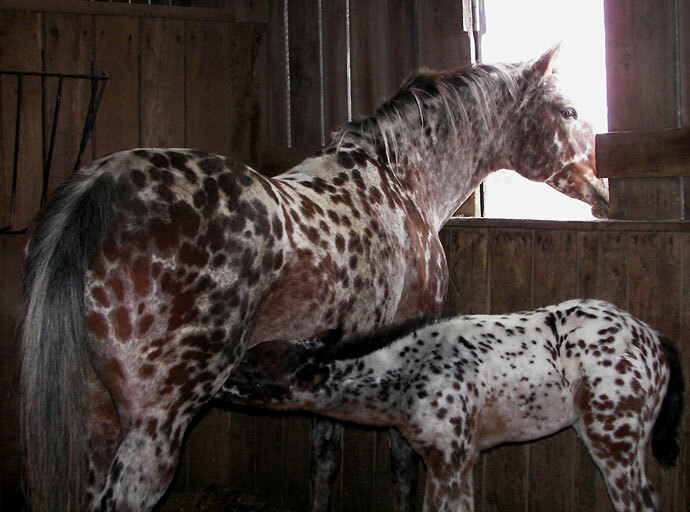 The rule of thumb for the second stage of delivery is 20 minutes before your foal may be getting in trouble.. I stepped in to help put some traction on the foal. I took off my sweatshirt and wrapped it around the slippery membrane covered feet and pulled down when Mauzi pushed. We were making no progress. I followed the legs with my hand inside the mare and found head and nose and was reassured that the foal was in good position. So we just kept trying, her pushing and me pulling and resting between contractions. Finally the filly began to move forward and it took all my strength to help her get head and shoulders delivered. BUT we did! I sat back and Mauzi and I rested while the new filly immediately began trying to stand. She had not suffered a bit with the extra squeeze and was quick to stand and nurse. The night was not over, as you will see below Jazzy's photo. 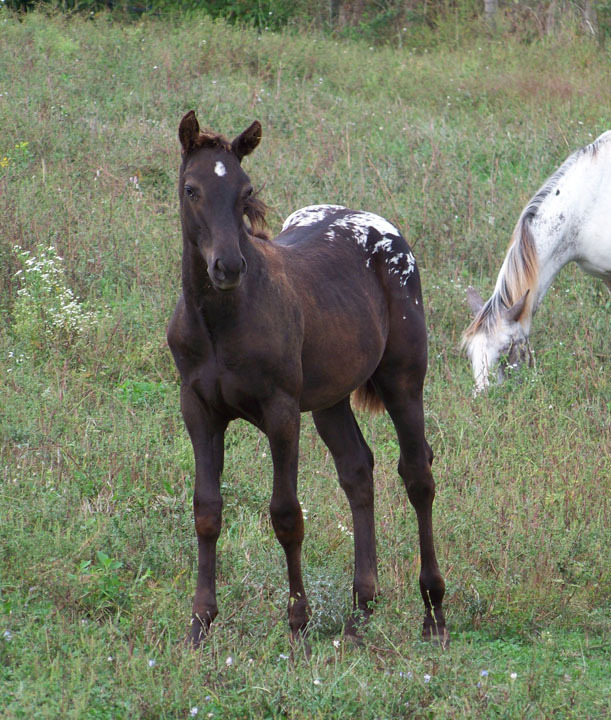 We had two foals last night just a couple of hours apart! (if you are on Facebook, you can see more albums of the foals). Nova's video was taken at 7 months old in early october. 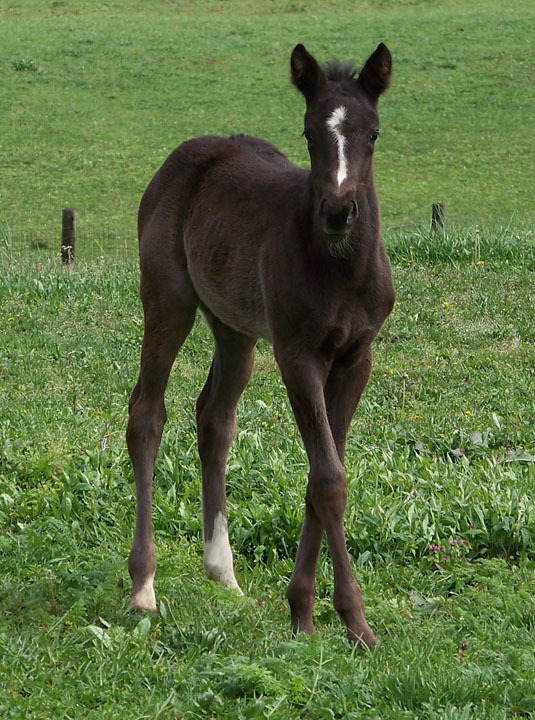 Jessica's Miss Kitty X I'm Bud.. first Bud foal! March 22: Kitty stayed in all day because she was actually squirting milk from her udder when walking. This seemed like a pretty good sign that foaling was very close ,and I checked on her thru the day and evening. She has had a foal in the afternoon before, so I didn't want to miss the birth. By 9 pm, if I watched secretly on camera, she was starting a ritual that is familiar with her. She circled the stall, stopped, looked out the window as if to check if anyone was around. The another circle, and peered into the barn aisle to check there, Then back to the window and round and round she went over the next two hours. 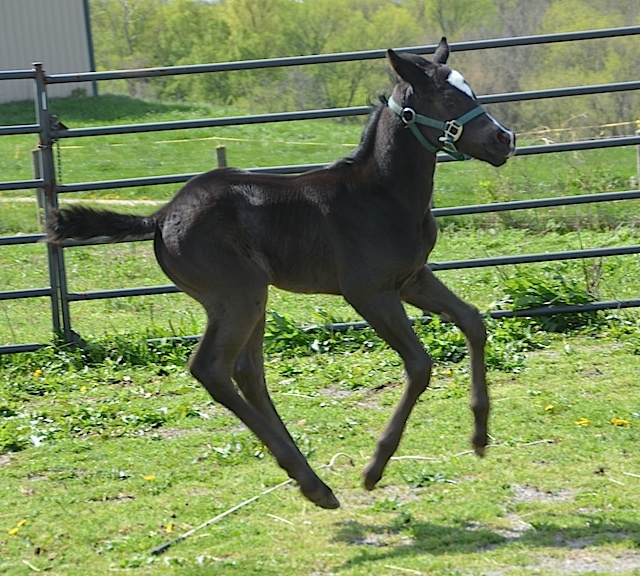 black near fewspot colt, "Mac"
Mac is Reserved for Larry! 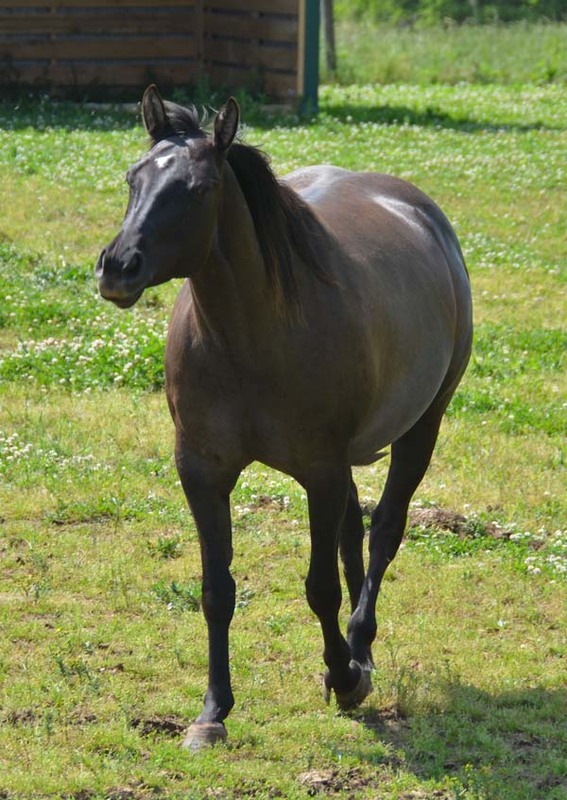 Sizzler Jo is a seasoned broodmare of l7 years old. 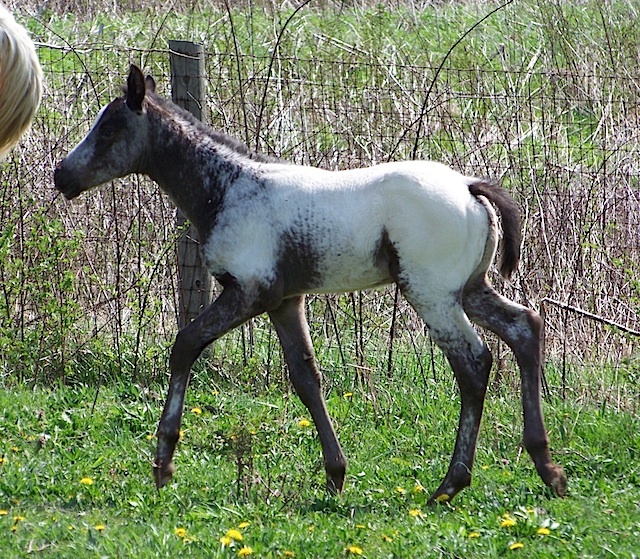 She spent most of her life in Alberta, Canada producing foals. 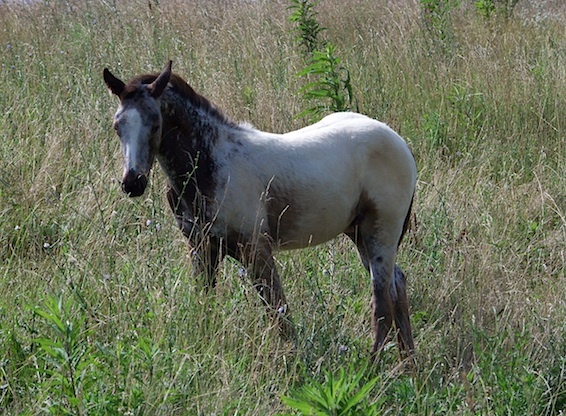 She came to me about three years ago when her owner could no long take care of her herd. I moved Jo to the foaling stall with a camera Friday evening, only to find out that the power source wire had gotten crimped and broken. I taped the two ends to a feed sack with wire's touching and the picture came back. I threatened anyone who touched the wires since I needed to watch Jo from the tack room. It had been a long long day with Dr. Will out to see Mauzi, and trying to get the daily work done at the same time. I allowed myself to doze a little around 11 pm, watching from my cot. At 11:40 Kitty got down to the business of pushing. The foal was obviously big, but kitty has delivered nine and could handle it. With the head and two feet showing, she was up and repositioning herself, and I was spreading hay around the stall floor. She must have fantastic pain tolerance because she had a few bites to eat in the middle of this delivery! 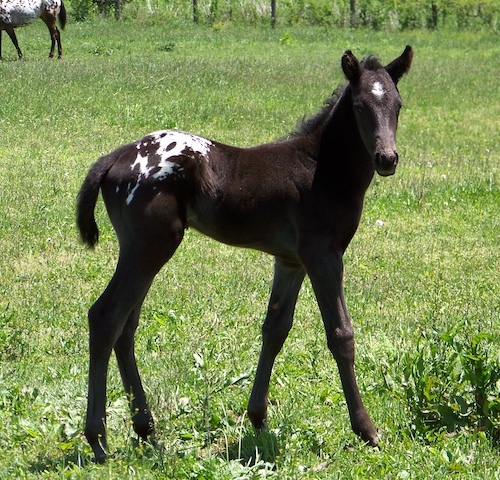 Her black filly was born around midnight and on her feet in about a half hour. 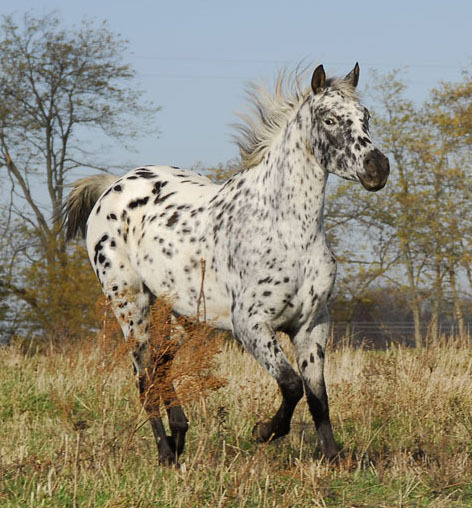 Luna is a sport horse prospect. 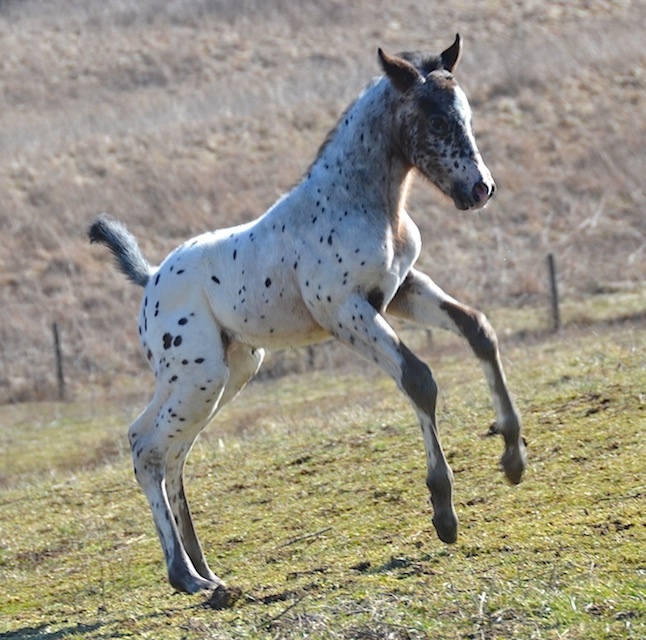 She is an athlete already with a long ground covering stride, speed, and a natural inclination to jump. Luna should finish at l5.2 hh with her sire being 16H Luna's hair test results returned from Animal Genetics Lab. 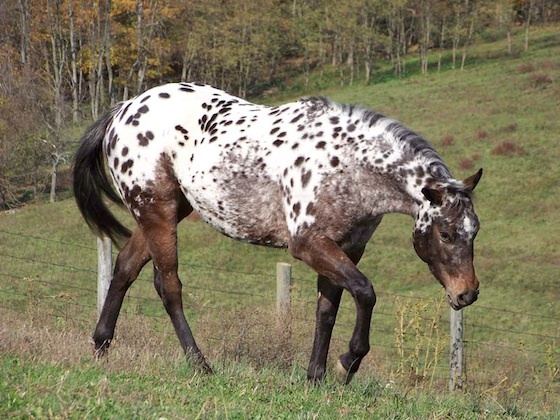 She is Ee LP/lp This means she is heterozygous for Black and DOES carry the Appaloosa Color gene (LP). She has some color change coming in her future. Offered for sale at $1500 more photos on For Sale page! 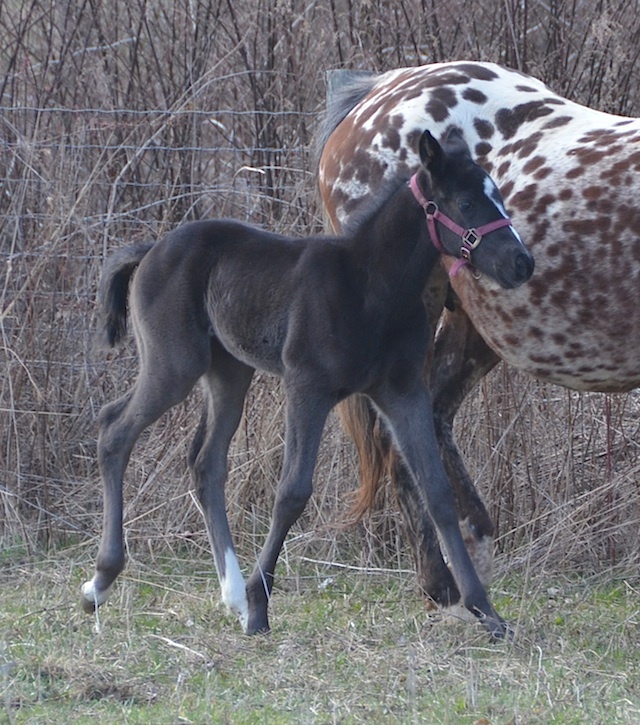 April 15 April 15th, about 4 am.. Diva foaled with ease a tall 42 inch black filly. I didn't do a thing. 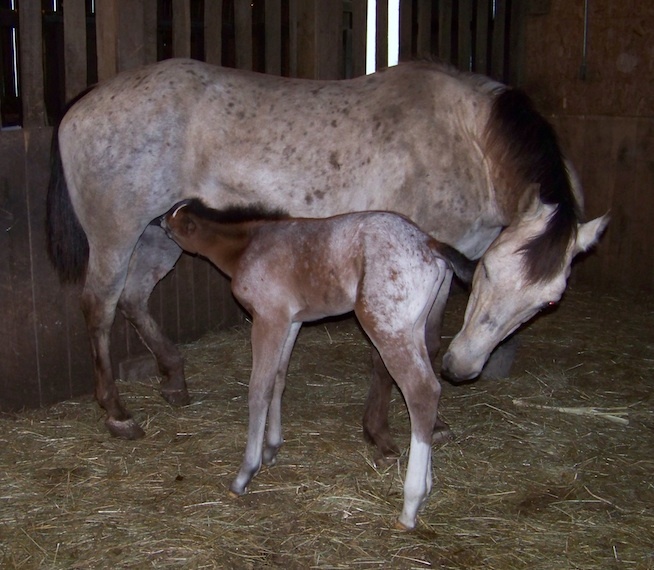 I was spending yet another night in the barn and saw a few nips to her side but no pacing or agitation at all. Her body condition had not changed, nor had her udder from the previous week. When she lay down, I thought it was simply to rest. I opened my eyes in a half an hour and a black filly was jumping around the stall having been born and gotten to her feet in just that much time! 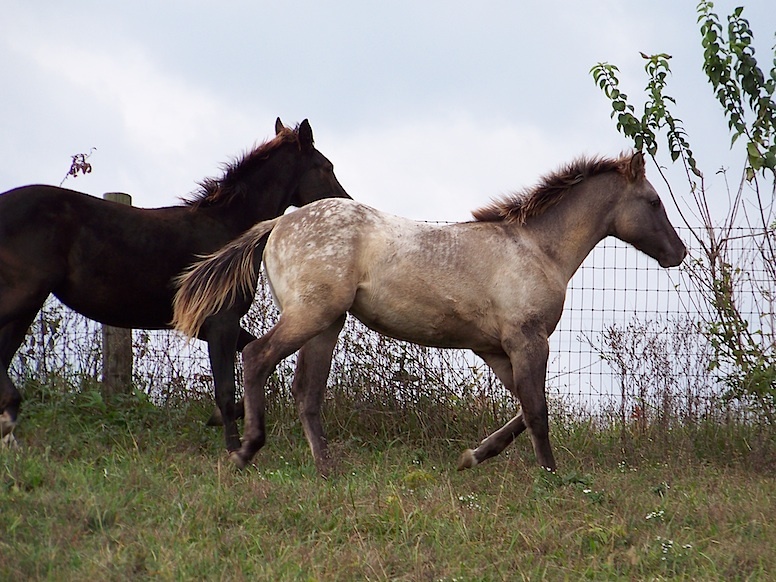 I saw this filly kick so hard when she was inside her mother the past few weeks, that she moved Diva's whole body. It looked like there was some sort of eruption going on behind her flanks. 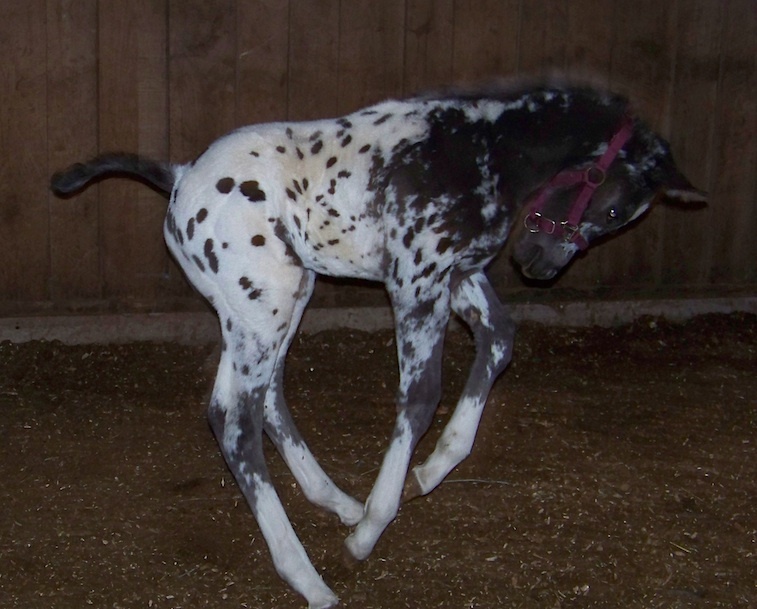 So I was not surprised at 4 AM to close my eyes and open them to a filly up and running with a curly black tail flying. I had to capture her to get her to nurse, but when she did .. that was at high speed too! There is something to be said for a l2 day late filly.. she was READY to get out of there and on with life! And so she has! Welcome Divine Magic! Diva and Magic are reserved for Kim! I was worn out. Jo really did not look all that close to foaling. She had no wax , no milk..and last year my notes said she showed labor like signs for THREE nights before foaling.I left for the barn about 11 pm and Mitch said "take your dog, you may want to stay there tonight". So I took Princess and was glad to find the camera working. I dozed from 11:30 to nearly 3 am, aware that Jo was doing all the classic early labor stuff.. looking back at her flanks, pawing, pacing, and generally staying in motion the entire time. I just kept snoozing and thinking.. don't get all excited.. she did this for three nights last year. I peeked over the sleeping bag and had to admit there seemed to be a foot extending from under her tail. I looked at Princess and said "time to go". 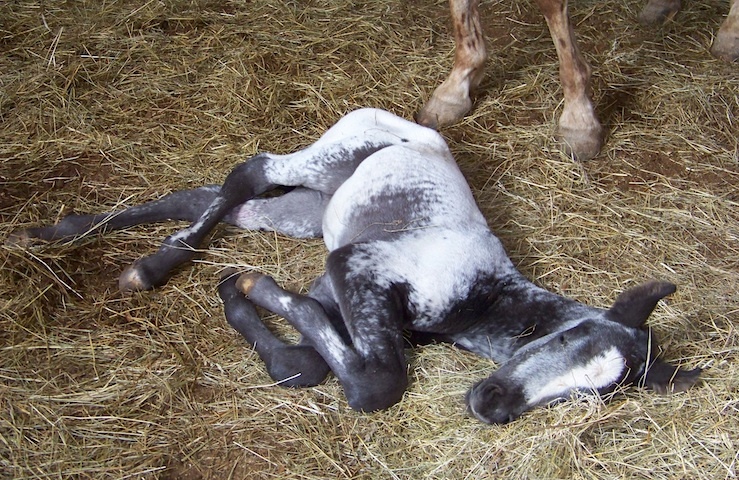 this chunky black and white near fewspot colt was lying on the floor. He was rather quiet, and did not immediately try to get up, but was breathing and looking about. He got himself to his feet with a little support by about 3:15 or 3:30. The video of him standing is below. Jo impresses me with her natural maternal instinct. She is so loving to her babies. By the way.. the camera wire died first thing in the morning. Good timing! Emma at three weeks old. This filly is very easy to get along with , sensible and calm. 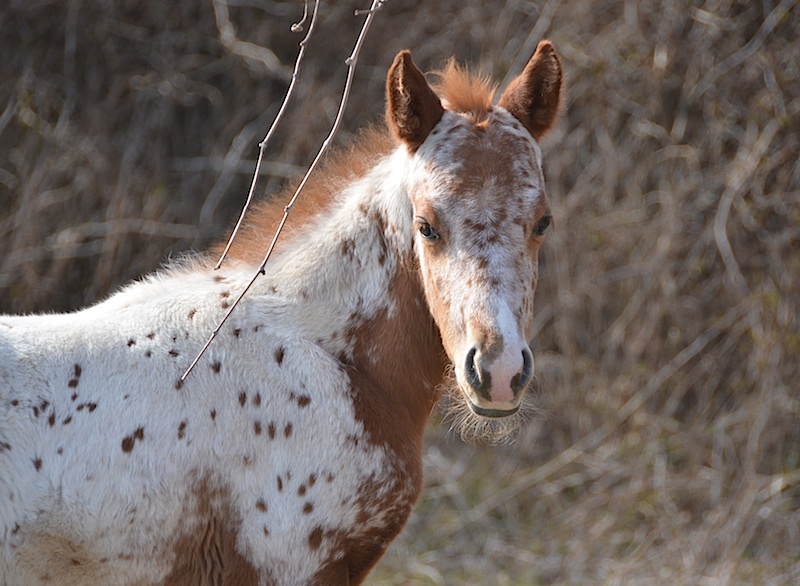 She's our beginner friendly foal of the season. She should finish at l4.3 to l5 hands, colorful and stout like her mama. I was on my 8 or 9th day and night in the barn last night, and I tell you my enthusiasm was waning! But I arrived thinking I'd just be sleeping once again at about midnight. Just as I settled into the cot with my dog, Princess, I noted a lot of tail action in Moon. I texted my son to bring me some hay for bedding just in case she actually had a foal. Thank goodness he DID bring me a bale because at 3:30 Moon delivered a colt who was strong and up on his feet quickly. I cleaned the stall and spread out that bedding and helped "Shine" nurse. 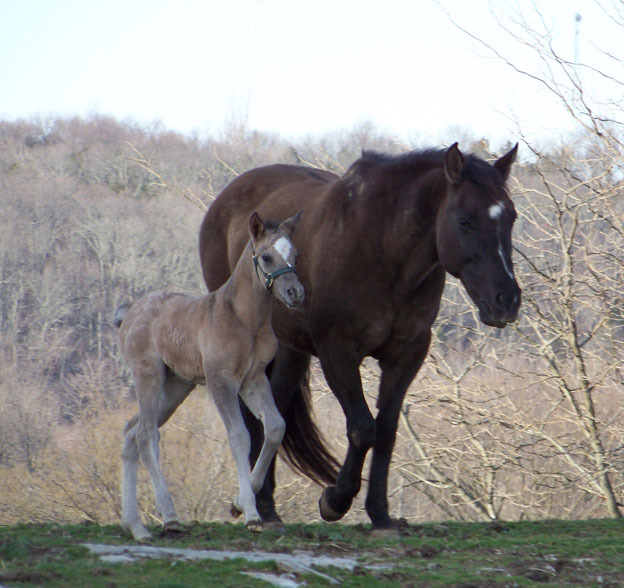 Moon had not passed her afterbirth, so I tied a little weight to it and milked the mare. This caused contractions and she lay down and passed it cleanly after about l0 minutes of me milking and the colt beginning to nurse. 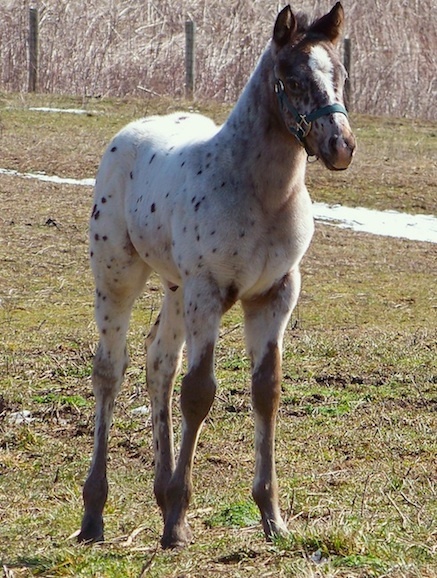 Shine is a bay snowflake colt. He is tall and will likely add more color as he grows like his siblings have. Video features |Shine at 4 months playing after a storm. Shine is at home with Sarah in FL! SKipelletta had wax on her udder yesterday AM on the 23rd, so she spent the day in the round pen watching the herd and eating hay, safely protected. It was an eventful day with a double fence jumping.. Baby Magic jumped four feet into a paddock and a two year old, Cleo, jumped OUT of the paddock, taking the fence with her. The whole herd had a round up and runabout. By evening I was weary from fence stretching and knowing I would be up at night . I camped out watching Skip at midnight. 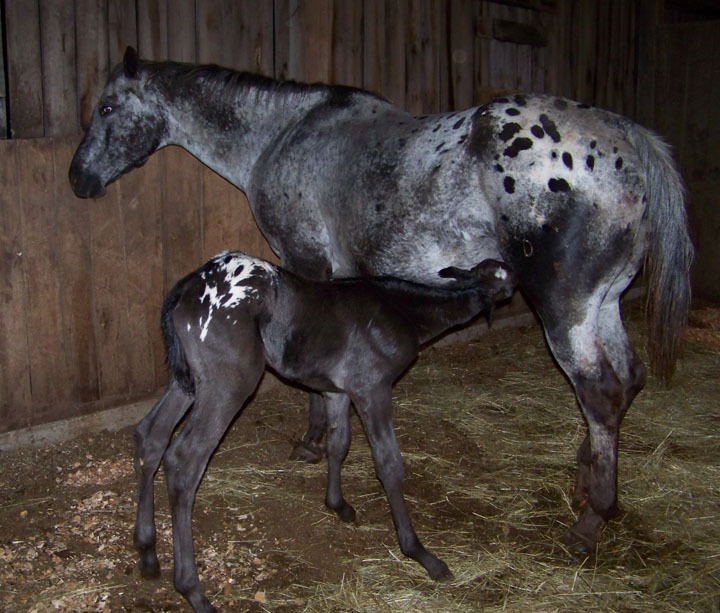 Skipelletta foaled at 1 am, and her blanketed filly has two hind stockings and star. Her delivery was text book and she did all the work herself as I looked on. Baby Secret was on her feet by l:20 and nursing by 2 am. I was very grateful for an UNeventful delivery from an experienced mare. I got 5 hours of sleep! Thank you SKIP! Skip's Secret Shado is reserved for Katherine in CO! Coffee went out in the rain yesterday and got a good bath. Her udder was about 80% full, body relaxed, but no real change in the last week. She was in a hurry to come in for dinner, and more restless than usual, looking back at her sides frequently. I switched stalls to put her in the dryer foaling stall. We've had so much rain, it's hard keeping the stalls dry and clean. and has a star on his forehead. He was trying to buck by l am! Cochise will be this boy's new name, Chico for short. Chico is at home with Ed in FL! 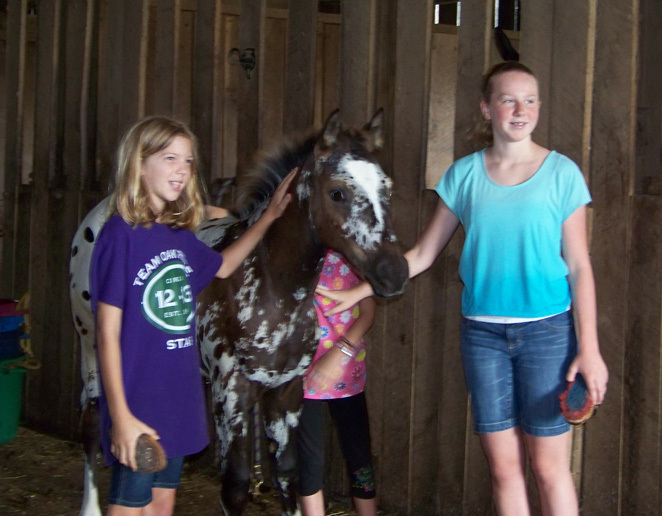 Some neighbors came to visit with the foals! Chico with his new dad, Ed, following a T shirt from home that mom wore.